There have been many products on the market today that have been specifically designed to strengthen and tone the body’s abdominal muscles. 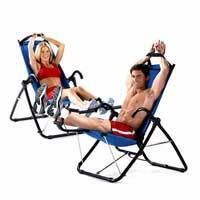 One of the most popular and well known abdominal exercisers in recent years has been the Ab Lounger XL. The key feature about this ab machine is that it supports the back and neck while you perform the exercise. This is beneficial for people who find the traditional sit-ups and crunch exercises difficult to do. Many find the traditional exercises can strain their back and neck as there is nothing to support them. The strain is mostly to do with people using the wrong technique. It would be advisable to use an abdominal exerciser first to strengthen your abs before attempting the harder traditional exercises.The Ab Lounger is basically a chair that you sit in. At the base of the chair are foot rests to place your feet and hand straps above your head that you grasp onto. To perform the exercise you push forward with your arms into a crunch position. The chair is connected with bands to create resistance that focus on tightening your abdominal muscles. As well targeting the abs the Ab Lounger XL also enables you to extend backwards to stretch your back. Another benefit of the Ab Lounger is that it is very convenient to use. It is light in weight therefore, it easy to carry. It is also easy to store as it has a fold-able mechanism that enables you to fold it flat and slide under the bed and out of sight. You can actually use it as summer seat. When the weather is warm and sunny outside you can take it out and sit on it with and ice cool drink and read your book and magazine. If you’re in the mood you can perform a few reps while enjoying the summer weather. There are tens of abdominal exercises that you could potentially include in your abdominal workouts and training programmer, but these, in my opinion, are two of the most important ones.